This is the third article of The Elementary Series. I will cover basics of mechanics, and focus on macro. I will clarify some misconceptions, and provide some generalisable rule of thumbs. Micro will be discussed in another article. This article covers the first three, so the focus is on the basics and macro. More importantly, I have a set of applicable rule of thumb that players can use to improve macro. This article is not limited to Terran. Mechanics is a topic that everyone is familiar with to a certain extent, and generally has his or her own opinion on it. I will start off with the definition (or maybe you can call it a description) on Liquipedia that I agree with. Mechanics is your execution of micro and macro. Fundamentally, your mechanics, as a player, represent the degree to which you have bridged the divide between mind and game – that is, your ability, as a player, to do what you want to do. Mechanics is how well you can execute what you want to do. Then, since no one wants to get supply blocked in the game, it is a matter of mechanics to not let that happen. If you are not capable of splitting your bio in the way you want to, then you have poor mechanics. According to this definition, if you are a new player who does not micro the bio as you do not know how bio should be split to be effective, this is not exactly a matter of mechanics. The above examples indirectly explain why many players limit their definition of mechanics to macro, and do not explicitly consider micro when mechanics is discussed. That is, everyone knows what good macro is, but that is not the case for micro. I have previously proposed adding attention as another dimension of mechanics, but I will keep this article concise to discuss only macro. Micro will be discussed in another article, and I will also elaborate on how that is related to macro and micro later in that article. There are two assumptions I want to clarify before I get into the actual discussion. Mechanics comes before all other skills. Mechanics is a variable that is stable at the individual level. Mechanics to Starcraft is like stamina to a ball game. You need to have a minimum standard for other factors to be relevant for discussion, as all techniques, tactics, or strategies are developed based on this requirement. I will use basketball for example. You can discuss about how to fake and get past a defender all you want, but it is irrelevant if you can barely move after several minutes of basic movements. Going back to Starcraft, an early expand build will always have better worker production than a one base tech build, and this is based on the assumption that both players can macro at a certain level. The same applies when an early all-in can be defended if the response is correct, and this also assumes that the player has the required micro level to execute the defence. However, mechanics is the alpha, but not the omega. I always see players given the feedback to improve on mechanics when they ask for help by posting replays, and sometimes they are even advised to practice by building only Barracks and Marines to improve mechanics. While this is a fair feedback to a certain extent, it is not exactly helpful unless that player does not have the minimum requirement to play the game. Realistically, you can always improve your mechanics, as it can never be perfect. Mechanics is something that you will improve all the time along with other skills in Starcraft, and it is not a definite prerequisite for other skills once you have reached a minimum level. More importantly, mechanics is more of an automated skill, which will just get better even if you don’t focus on it. Back to basketball as an example, your stamina will improve automatically as you try to improve your shots by shooting 200 shots everyday, and you don’t have to train your stamina to the level that your fatigue does not affect your 200th shot before you start practising your shot. There is variance in an individual player’s mechanics. You can perform at a score of 90/100 in one game, and also at a score of 40/100 in another. There is “form” in mechanics. I am sure you have experienced games whereby you just keep getting supply blocked, and things just don’t go smoothly. A good way to visualise it is that, you have your best and worst standard, and then there is a mean. Below image shows what I want mean. The grey bar is basically the “data” of a player’s mechanics performance in a certain period of time. The blue line is the individual’s best in terms of mechanics performance, the red is the worst, and the purple is the mean. The distance between the worst and best shows the consistency of a player’s mechanics performance, and the closer it is the more consistent the player is. 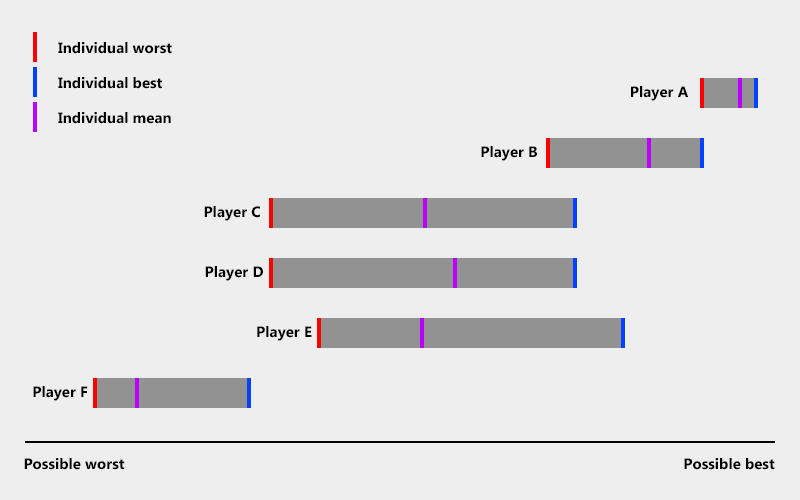 Mean can be seen as how often the player plays to his/her potential, so the closer the purple line is to the blue the better it is. I use Player C as the base comparison. Player A shows how a professional player’s mechanics should look like, whereby his/her best is close to the possible best. More importantly, the distance between the best and the worst is small, as it shows the expected consistency of a pro. Moreover, a pro’s mean is usually closer to his/her best than to his/her worst. Player B is what a good non-pro player looks like. The distance of the best and worst show that it is hard to be more consistent than a pro due to the amount of practice. A good non-pro needs to bring out his/her best to stand a chance against a pro’s worst in regards to mechanics, so the blue line of Player B is about the same as the red line of Player A. Player D is probably what most of us look like in general. We are not that consistent, but we usually perform closer to our best than to our worst. Our worst happens, but not as often as our best happens. My personal worst is so low that I forget the first Supply Depot, but it rarely happens. Player E is someone who is “mechanically gifted” (better best and better worst than an average player), but has performance issue (mean is closer to the individual worst). Player F is basically a new player. The above demonstration explains why I often get frustrated at myself for performing poorly. I guess I have that “Korean mindset” whereby I get upset for not being able to show what I am capable of. The purpose of this section is to point out that mechanics performance is susceptible to individual’s form, and it is labile. This is something that has been overlooked when people discuss about how good or bad a player’s mechanics is, and mechanics is frequently and incorrectly assumed to be a stable quality at the individual level. I believe it is important to bring this up before I actually discuss about macro and micro. Macro, or macromanagement, is the ability to manage the economy well. This includes, and not limits to, mining, spending mineral and gas, avoiding supply block. It is almost always better to constantly do these few things. You cannot truly recover the opportunity cost lost of not spending the resources. For example, as a Terran, you have bank up 1500 minerals now, so you want to spend it by saturating your production buildings with unit production and build more production buildings. Although this is arguably the best option at that point of time, you are still in a worse situation than you would be if you have spent the 1500 minerals earlier. Generally, the only time to not intentionally spend the mineral and gas is in the extreme late game situation, whereby both players are maxed-out and more than enough production buildings to re-max the supply. A niche example is to save mineral, gas, and larvas for Spire to complete in order to make a certain number of Mutalisks. In my opinion, the three base paradigm is the most important concept for macro in Starcraft II, as it directly affects important macro decisions like when to expand and how many workers to have. This concept is so fundamental to our current understand of Starcraft II that, a map is generally considered unacceptable if it does not fit the three base paradigm. Three base paradigm refers to the phenomenon that the most efficient state of economy is three fully saturated mining bases. It gives you the best balance between resource gathering rate and resource expenditure rate. The rule of thumb to have three mining bases allows you to have a good worker to army ratio. You would have too many workers with four saturated mining bases that you do not have a sizable army when you are at max supply. This then leads to the question of how many workers you have in total before you stop producing more. Thus, the three base paradigm concept affects the two most important thing in our macro, and they are the number of bases and number of workers we should have. The three base paradigm directly affects the number of bases we should take at the same time, and as the name implies, it is best to have three bases in general. When we watch a professional game, you often hear the casters say a player is taking a fast third base, but you have never heard of a player taking a fast fourth base. Fundamentally, even though all else equal you want to have as many bases as possible, there is no benefit in having the fourth base. This is because a base is rather meaningless unless you can mine from it, and hence, it is about the number of active mining bases you have that matters and not just the number of bases itself. This concept is so basic that people don’t talk about it explicitly, but everyone just follows the “rule”. When you examine different builds and strategies of any race, you can tell they are all based on the three base paradigm. For example, Zerg may have the fourth Hatchery not at a normal mineral line but next to another Hatchery as a “macro” Hatchery. This fourth Hatchery allows Zerg to have more production power, but it does not directly increase mining rate. It is obviously better economically to have the fourth Hatchery built at a normal mineral line for future mining when one of your bases has run out of resources, but it also means that Zerg have a greater area to defend with that fourth Hatchery rather far off. Therefore, having the fourth Hatchery as a macro Hatchery allows you have the optimal mining rate and improved production power without increasing your vulnerability. Importantly, you almost never see Zerg under normal circumstances build the third Hatchery as a macro Hatchery, as the third Hatchery would be usually built at the normal mineral line. This is because the third Hatchery as a macro Hatchery sacrifices mining for security, and it is not a good trade off based on the three base paradigm. Even if you want to have a mining rate of only two bases and a production rate of three Hatcheries due to strategic reason, for example, an all-in, the third Hatchery should still be built at the normal mineral line. This is another reason why players check the number of Drones at the third base to deduce whether Zerg is planning a two base all-in with three Hatchery production. Not having a third base for Terran and Protoss is a big telling sign whether the player is attempting to do a two base build. It is a big sacrifice to not have the third base as that player does not have the optimal mining, and the sacrifice has to be rewarded elsewhere (i.e., a bigger army in a short time frame). Therefore, in any decent scouting guide, you will read that scouting opponent’s third base timing is an important piece of information that allows you to make necessary deduction about certain builds. You almost never read about scouting the fourth base, because it is not exactly a strategic option. As mentioned earlier, it is about the number of active mining bases and not the number of bases itself, and this has to do with the optimal number of workers based on the same three base paradigm framework. Each gas geyser can be effectively mined with a maximum of three workers, but the answer for each mineral patch is “it depends”. The maximum number of workers for each mineral patch is three, and the fourth worker does not contribute. However, the most efficient mining rate per worker is to have two workers per mineral patch, because the third worker has a diminishing return. Further, to make things more complex, the third worker is marginally more efficient on a far patch than a close patch. To keep things simple, a rule of thumb for the most efficient number of workers per base is 22. Two workers on each of the eight mineral patches, and three workers on each of the two gas geysers. It is better off to send the 23rd worker to another mining base. Therefore, according to the three base paradigm, there should be 66 workers in total, and 134 supply is allocated for other units. You can read more about this on liquipedia. In my opinion, it is better to go beyond 66 than the other way round. Obviously having the third mining worker on some mineral patches is not exactly a bad thing, but the main reason for that is to take into account that worker count will drop when the opponent attacks and harasses. You rather have more workers than the theoretically optimal number when opponent is not killing your workers than to have fewer workers than the optimal number when opponent is killing your workers. In other words, you don’t want to keep it at 66, and have to replenish the number from 40 again. You prefer to have say 73, and have to replenish the number from 47. Mathematically, both have the same number of workers killed, but it is easier to replenish the same number of workers lost when you have more workers left due to the relative mining rate. Of course, the “optimal” number of workers may vary according to the race (Zerg should have a higher worker count in general), but the fundamental idea remains the same. The three base paradigm essentially put a cap on the efficient mining rate, and this indirectly affects the optimal production rate. Thus, for each race, there is a set of optimal production framework to get the most out of the given mining rate, and I have developed the concept of convergent points for Terran based on this set of assumptions. You always see Terran have five Barracks, one Factory, and one Starport (5-1-1) for a bio composition when Terran have just taken a third mining base in any match up. This is because the mining rate restricts the amount of production you have, and your number of production building should also be aligned with that. I will not discuss in depth about convergent point here, but I strongly recommend you to read the article. It is probably my best article. More importantly, in practice, the knowledge of convergent point gives you guidance on what to build, how many to build, when to build etc., and this allows you to make macro decisions a lot easier. Other races also have their own set of convergent points such that they give you guide line of whether you should add more production buildings. Macro is about managing your economy as a whole, and that includes many different things as I have already mentioned earlier. It is easy to miss a thing or two when you have a long list of tasks in order to have good macro, and hence, players have something called macro cycle to form a habit of doing all these things in systematic sequence. Below is a short list of core tasks that most players will do for macro, and they are in no particular order. These four things all have one thing in common, and that is they all require an action periodically. For instance, after you build a worker, you have to wait for a while before you build another worker. The task does not get any more efficient by clicking quicker or more. Thus, it is a matter of doing the same action again when it is needed, and how little delay you have from the time that it requires the action. Intuitively, you will keep checking your Command Centre (say Terran) to ensure that you are ready to queue up another worker when the worker that it is building is about to complete, but we all know we cannot always keep up with that due to various limitations like apm and ongoing battles, and so on. To make this even harder, all these macro tasks I listed vary in the time they require the same action again. For example, you need to queue another Scv every 12 seconds (i.e., the production time) from the time you started building the last Scv, but you do not have to make a Supply Depot every 12 seconds. This is where having a macro cycle can help to simplify things and decrease the opportunity that you have in omitting a necessary macro action. Using just the four tasks above as an example, a simple macro cycle can look like this. Check if you have a worker building in each Command Centre. Build a worker from each Command Centre accordingly. Check supply to see if you will get supply block soon. Build Supply Depots accordingly if needed. Check if my production buildings are active. Build or queue more units accordingly. Check resources to see if there is at least 300 to 400 mineral left. If you do, spend it on more buildings, for example, build more Barracks. The above sequence of actions should become a habit. The automated sequence of checking one task after another reduces the cognitive load of checking each task independently in random order, and this significantly reduces macro task omission. I intentionally start the macro cycle with the task that has the shortest cycle, and that is worker production. This is because you want to use the task that has the shortest cycle as the base trigger to have the habit in order to optimise a macro cycle. It is counter-constructive if you use supply cap check as the trigger, because that means you only build a cycle of workers for each Supply Depot you make and that is obviously bad. I know Zerg may work differently, but the macro cycle concept still applies. Watch the video below. As you get better with your macro cycle, you can even add more advance tasks to get the most out of your habit of checking everything periodically. For example, you can add checking the mini map after you have made a round of units, and this helps you to do more tasks consistently all the time. This is why you see professional players keep cycling through their production and upgrade buildings even though they do not have to do anything with them at that point of time. These are a set of simple tricks that help you to get better with macro on top of a macro cycle. The other important reason to have worker production as the first step of the macro cycle is that you should always prioritise worker production in macro under normal circumstances when you do not have enough mineral to build workers, units, and supply buildings at the same time. Continuous worker production the key for a good economy, and that is the foundation of macro. As the number of mining bases increases, the supply produced per production round increases. Hence, the number of supply building built per cycle has to increase too. Long story short, you should build one supply building per mining base. Thus, when you are on two mining bases, you should build two supply building per production round. It is not a perfect measure, but it is a good rule of thumb. There will be times when there is not enough resource to complete a full production cycle to build every unit you want. For example, you have three Barracks, one Factory, and one Starport, but you do not have enough mineral to build from all of them. You should build units from the Factory and Starport first, then spend the leftover resource on the Barracks. Long story short, this helps you to spend the gas better, and it balances the mineral and gas ratio. You should queue as many workers and units in your production before initiating a battle even though you would have “over-queued” the production or do not have enough supply space for them at this point. This is to allow you to spend all your attention and apm on the battle, which you may not know how long it may take, and not have to go back to your macro cycle. It is normal to slip in macro when you focus an important battle, but this over-queued method helps to minimise the problem. I will discuss more about the trade off between macro and micro in the part two of this article. I came to the same conclusion, but it took me ~10,000 games and ~7 years. Haha, the hard part to me is to apply consistently. Definitely the best article written for Star Craft. That’s quite an exaggeration. But thanks for the compliment! I’m curious, what is your sc2 level? I am very bad. Nope, not even joking. This is because it covers some of the most fundamental aspects of gameplay. Believe me there are 5 million pages of numbers and stats that mean nothing if a player can’t implement the techniques. The reason this makes sense, and for that matter this entire site and every post makes sense to people is because it can be properly used you give us techniques we can use. The article is great because it has to do with ladder play. But I think another important side of this is ladder games and how pros use the ladder to warm up. Polt uses this method, and other players as well, MC. Very few good players stream but most of the games are spent just trying to attain a certain play speed. Polt says losing doesn’t matter because perhaps we never know why we lose. Other players suggest, like you, a certain skill level must be obtained or losing doesn’t matter. The macro cycle enables a player to effectively gauge his play by winning or losing. Arguing games can be won because a player has better cycle than the other isn’t important. The methods used to reach a certain level are. Micro training? A coach who scours the earth for the best builds? Challenger skills level? I think the methods of training are an important topic. The macro cycle is as fundamental to the game as the code its built on. Thanks. I thought a lot about what to include and what to exclude regarding the topic.